the high-tech, large-capacity sector was a water-cooled, 750cc transverse four-cylinder two-stroke. This layout is rare because of the extra width imposed on a two-stroke by virtue of its intake and exhaust systems. Yamaha used it effectively with a remarkably compact unitconstructed engine with the ignition and generator mounted behind the cylinders. Moreover, Yamaha had equipped its show bike with electronic fuel injection. Its viability was perhaps questionable, for sneak photos of prototypes revealed that they were equipped with carburetors. Apart from its technological impact, the GL 750 brought a breath of fresh air to the styling department, with carefully considered forms and colors. Particularly appealing was the extremely large four-into-two exhaust system that contributed to the excellent power output In 1972, the YZ 648 appeared, first in a long line of 700 (and subsequently 750cc) racing bikes whose engines were modeled on the famed prototype. The same engine also spawned the 1973 OW20, Yamaha's first 500cc Grand Prix machine, which was ridden by Jarno Saarinen. This family of engines brought the marque four 500cc world titles plus three in the 750 class. 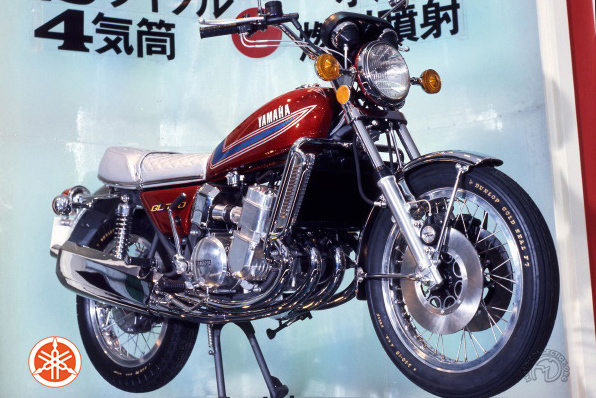 Though it's over 40 years old, Yamaha's GL 750 remains one of the most memorable of all show prototypes.